Hi everyone, it’s Beckton, back today to talk about a very useful tool that I have learned about called Unbounce. In simple terms, Unbounce is a landing page and overlay builder. To understand Unbounce, we must first talk about what a landing page actually is. A landing page is a standalone web page created for an ad campaign. Essentially, it is where the user “lands” when they click on an ad, and it is designed with a single objective (a conversion) that we want the user to do. By directing the user to a simplified page that leads them directly to a conversion, as opposed to making them sort through your main homepage, conversions are greatly increased. Creating landing pages with Unbounce is so easy because it brings is a modern and easy to use drag and drop editor with no coding required. For those who are technically inclined, it is possible to add custom HTML into the editor for greater customization. For the vast majority of users though, that isn’t necessary. The great thing is Unbounce can be simple or complicated depending on your use case, but is almost equally powerful both ways. For context, there are also other great landing page builders (Leadpages.net for example) and ClickFunnels, which allows you to build a marketing funnel. A marketing funnel is essentially a series of landing pages which attempt to engage and capture the user more frequently than a typical landing page. I would recommend you check out all 3 options to see what is best for your situation, but in principle they are all similar. In this article, we are going to focus on Unbounce as it is what we use here at Ten Golden Rules. The highlight of Unbounce is certainly the drag and drop editor that I mentioned before. You can pick from a variety of different elements like pictures, text, buttons and even video. All you have to do is simply drag them in to your page. In addition to that, Unbounce makes it very easy to put more complex items like forms in your landing page. Just drag in the form and it will automatically deliver your form data into Unbounce when a customer fills it out. For greater customization, you can opt to have those form results sent to an email each time the form is filled. Or if CRM software like Zoho or ActiveCampaign is more your thing, Unbounce has integration with many of these to send form data right into. All of these features allow you to build landing pages faster, yet they are also much better than ones made by hand. Some other unique time-saving features of Unbounce are how it is very simple to create two landing page designs and see which one drives more conversions. We often call this an A vs. B Test. In Unbounce you can easily create a second version of a page with a few clicks. And, it allows you to easily split traffic between the two different designs and see which one performs better. The “A/B Test Centre” in Unbounce, it really is as easy as clicking a few buttons to set up a true A vs. B test. But the real test of any tool like this is not whether it is useful to us here at Ten Golden Rules (It certainly is), but whether it works well for you. With all these features, and the extreme ease of use, Unbounce certainly is great for marketing agencies like us or other companies. If you only have one small WordPress site, and don’t mind being more hands on, other services like Thrive Landing Pages may work better for you. However, for most people, the convenience of Unbounce and the many benefits it has are well worth the $99 per month it costs for an “Essential” license. After all, Unbounce costs money, and building a conventional landing page is free right? Well, it isn’t quite that simple. With a traditional landing page you have to have someone to design and code the whole landing page then upload it to your site. With Unbounce you only need to use one of their templates or design the page yourself in the editor before it is ready to go live. This means that although Unbounce may look a little costly, it saves money in the end by not needing a dedicated coder on staff to do these pages. 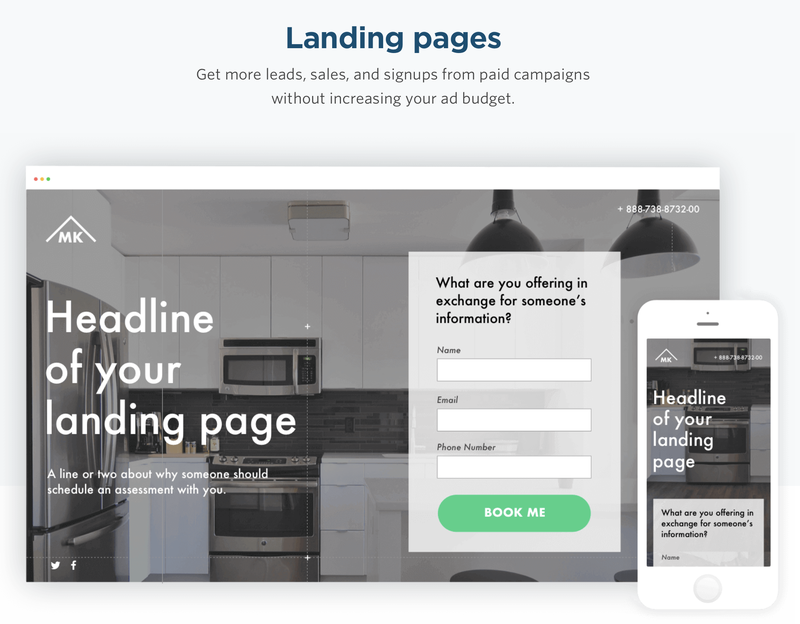 Almost anyone who is familiar with basic design can create and publish landing pages, which is one of Unbounce’s greatest strengths.